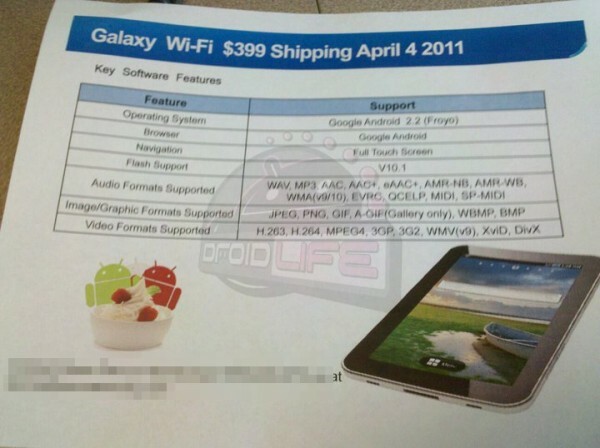 One of our posse members was hanging out at a technology fair today and it just so happened to include a Samsung rep who was quick to hand out the flyer above which shows that the wifi-only Galaxy Tab version should be out by April 4. Priced at $399, this seems like a decent deal, but aren’t we all positive that it’s too late for the GTab at this point? We know that the 3G version was a disaster, haven’t heard anything about the 4G version since CES, and with Tegra 2 devices coming out in waves over the next couple of months, I’d say that this version of the GTab will likely be another dust collector. And guaranteed to be if the wifi XOOM is released during that same week. Oh, and talk about Photoshop fail in that picture…yikes.